Everything that makes a Bourbon great. Knob Creek is a special small batch brand of Beam-Suntory. It's tailored — along with its sister labels Booker’s, Baker’s, and Basil Hayden’s — to the more discriminating Bourbon lover. You. The Knob Creek brand was launched in 1992 and hasn't changed much since, besides adding additional products to the lineup, including a Single Barrel Reserve, a Straight Rye, and a Knob Creek Maple Bourbon, all of which are multiple award-winning expressions. 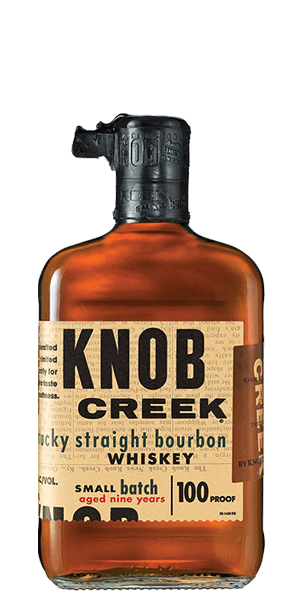 Knob Creek Patiently Aged Kentucky Straight Bourbon is the core Knob Creek product. It's one of our favorite daily drinkers, especially for cocktails. It is bottled at a full 100 proof / 50% ABV so it comes with a kick. What does Knob Creek Patiently Aged Kentucky Straight Bourbon taste like? The Flavor Spiral™ shows the most common flavors that you'll taste in Knob Creek Patiently Aged Kentucky Straight Bourbon and gives you a chance to have a taste of it before actually tasting it. Love this bourbon. Great strong taste on ice and develops into a lovely sweet drink the longer its left. Also great in a Godfather. This is an incredibly smooth bourbon and the cinnamon & clove both really come through nicely without being overly spicy hot. For being slightly higher abv than most straight bourbons, the higher abv really doesn't show itself in the flavor. Smooth and easy, full of flavor for a great price. Good alternative bourbon - doesn’t approach the complexity of Blanton’s, but a good evening drink. It’s just OK. Seems to have an edge that’s less interesting than we prefer. Surprisingly delicious, pleasant aroma and smooth mouth feel. Nice flavor. This bourbon is a must have for any home bar. It is an absolutely delicious bourbon with a wonderful experience from start to finish. This is my go-to. It has great flavor on the front end, and enough burn on the back end to know that I'm drinking a good whiskey. Pleasantly surprised by this one, never tried it until now. Smooth with some low heat on the finish. I know every bar in America has this on the shelf....but not mine. Not a fan. Did not enjoy. Have not tried a Jim Beam product yet that I enjoyed. Good burbon like it supposed to be. Warm, brown sugar aroma. When sipping it neat, the 100 proof packs a punch and adds to the zing. The spice in the flavor was a little overpowering for me, but it's one of the first bourbons I've tried and I enjoyed it. Smooth with a sweet heat flavor. Doesn't have the long finish I prefer in my bourbon. Caramel and a bit of pepper. Not too astringent and my go to cocktail bourbon. Full of flavor and heat, delicious!! High heat, alcohol forward, spirit with caramel, nuts, & baking spices. Best if drank slightly diluted. Single barrel is the best! Try it neat or with a splash of water. My favorite adult beverage. Straight up, on the rocks or an old fashioned, I love it any way served. This has been a staple in my home for years. Great on the rocks without breaking the bank. Oh I do like the good bourbon.